The XDS-3FL is a very powerful fluorescence microscope, which is used in both high-quality routine applications, as well as a supplement to the best research microscopes. The fluorescence microscope is characterized by the bright light 30W, together with a complete phase ring set, a photo port and the different carriers for Petri dishes and flasks. By the first-class optical quality and mechanical flexibility the fluorescence microscope XDS-3FL provides with great confidence for the future. By the first-class optical quality and mechanical flexibility well equipped for the future. Despite the few control systems, the fluorescence microscope is very versatile. The controls are convenient and comfortable positioned at the fluorescence microscope so they allow an easy and enjoyable use.In addition, the fluorescence microscope is different in the two variants in lighting. 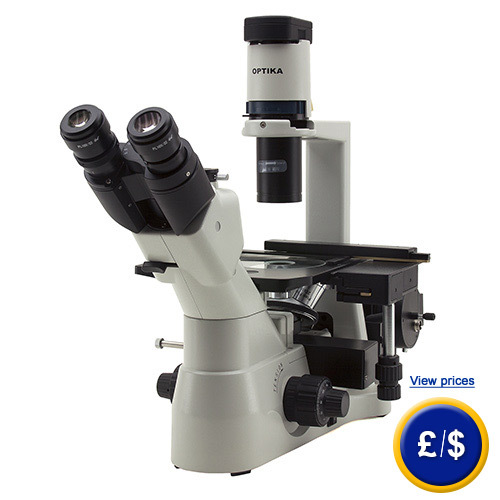 If there are any questions about this inverse biology microscope, please have a look at the technical specification below or call: UK customers +44(0) 23 809 870 30 / US customers +1-410-387-7703.. Our engineers and technicians will gladly advise you regarding the fluorescence microscope or any other products in terms of regulation and control, or scales and balances of PCE Instruments. Blue and green fluorescence filter sets. FLUO 40x/0.60 (working distance 2.6 mm). 119 x 70mm X / Y movement. Exchangeable metallic inserts for specimen slides, Petri dishes and flasks.